Team: Joan Benefiel + Jeremy Leichman / Figuration L.L.C. 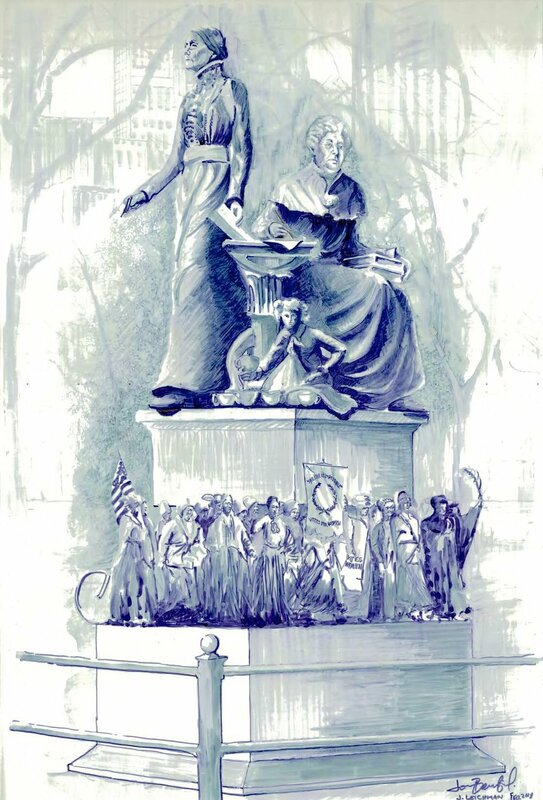 Our concept is a bronze and stone monument to the totality of the Woman Suffrage Movement, both the founders and the untold numbers of women, known and unknown, who fought for 72 years for the right to vote. It features Elizabeth Cady Stanton as the intellectual voice, the woman of letters who articulates the message, and Susan B. Anthony as the woman of action whose speeches and revolutionary acts ignite and capture the imagination of the movement. The shared table between them is a symbol of their powerful collaboration. The next generation is represented in a precocious young girl challenging the viewer to carry on the struggle. These three figures are borne aloft by the untold masses of women who took action, seen here breaking tradition and bending the will of the nation ever more towards equality. Rather than depicting a single important moment in history, we elect to show an amalgamation of the many parts of the movement, across generations, blending timelines and personages to relay the full scope and contributions of so many women. Particularly important are the contributions of women of color, their activism came with much greater personal risk. We feel that simply listing the names of those we know is not sufficient to tell this story, so we propose to include individual portraits of the 21 women listed in the RFQ in and among the marching crowd. We have also endeavored to create a sculpture that both works within the canon of the traditional “man of letters” monument style presented in the Mall while turning it on its head. Typical in this style are the elements such as a contemplative seated figure, interior furnishings brought outdoors, and a high base that raises the central figures above us. Our concept has all of these elements but then goes further with a “break” in the base caused by the marching mass of figures that comprised the Woman Suffrage Movement. Our concept is steeped in the tradition of monumental sculpture and historic portraiture with the contemporary twist of the base. The result is a monument that intentionally breaks tradition in order to redefine the acceptable norms, just as the movement it memorializes did. 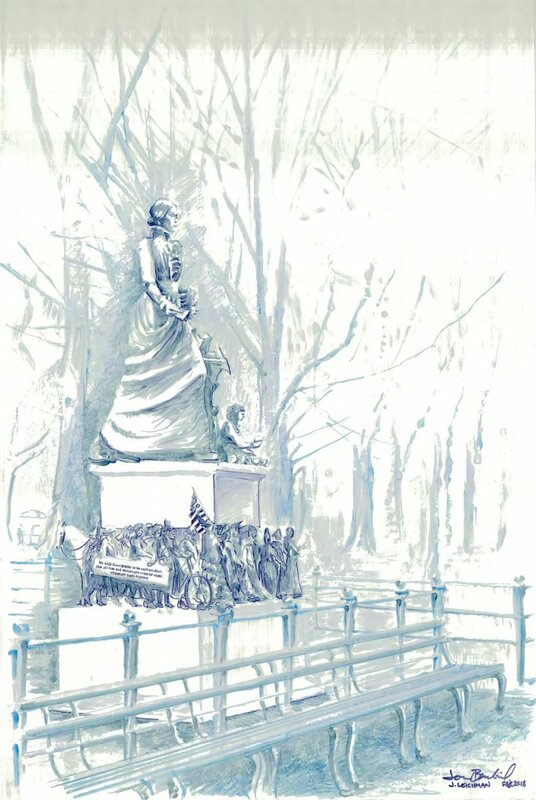 Our concept memorializes Elizabeth Cady Stanton and Susan B Anthony as they were known in life: A pair of brilliant, very different women bound together by a mutual determination to revolutionize the social and political climate for American Women. Out of their friendship grew what became a revolution in the history of our nation. Although they didn’t get to see it’s culmination in their lifetimes, they forged a path and ensured that failure was indeed impossible, as Anthony declared in her final speech shortly before her death. At different times and throughout their lives, both women wrote and spoke prodigiously. Nonetheless, Anthony is remembered as the persuasive speaker and Stanton the powerful writer. One without the other would not a movement have made. As a mother of seven children, Stanton was homebound with domestic responsibilities for much of her life. For Anthony’s part, she made the conscious decision early on to be unmarried, so that her life would not be hindered by domestic distractions. As such, she made herself free to travel and spread their message far and wide. She sometimes stayed out on the road on a speaking tour for as long as five months. Stanton, all the while, wielded the power of her pen, providing Anthony with the volumes of words that inspired her political strategies and fueled the movement. Depicted in our monument dressed in her typical long silk dress with a tall lace collar, hair smoothed back and twisted into a tidy knot, Anthony strides forward with confidence, determination, and grace. Her right hand leads the way with ballot ready to cast and she is sweeping up a copy of their Revolution newspaper in her left hand to take along with her. The sculpture of Anthony is larger-than-life, approximately 8-feet tall, comparable to the scale of the other figures along Literary Walk and throughout the park. She looks fearless in her portrait as she did in life. While she received a standing ovation for her speeches in the latter part of her life, that was not the case in the early days of the movement. She was more often met with jeering and boo-ing crowds who came to see her just for the novelty factor and to make fun of her. But nothing could dissuade her, even if she was sometimes discouraged. Not even angry mobs that tried to attack her and even burned her in effigy. Her confidence was unshakable, especially as she went to cast her ballot in the presidential election of 1872 and two weeks later when she was arrested and found guilty of “illegal voting”. Our portrait of her depicts her striding up to drop her ballot in that ballot box, knowing it was illegal, and knowing it was an act of protest that would have repercussions. That act and the trial that followed gave her the welcome opportunity to spread her arguments for suffrage to a much bigger audience. She spent the four months between her arrest and trial speaking in town after town on the question of if it was a “crime for a citizen of the United States to vote” and turning it into a popular topic of debate. Stanton is seated at her writing table, wearing the voluminous skirts and shawl she was typically photographed in, holding her books in one hand and writing with the other. She looks into the distance, as if lost in thought. It appears as if she might be about to stand at any moment. Not one to sit comfortably in confines of any sort, her left foot is already off the edge of the base, reminding us of her innate revolutionary nature. Stanton revised the Declaration of Independence to include the word “women”, read it at the 1848 Women’s Rights Convention, and it was shocking! While the majority of women and men there that day could agree in theory to much of what they were proposing about equal rights for women, the idea of giving women the vote rose as a stubborn point of contention and as such became the central goal of the movement. Along the way, change was made to improve numerous laws and rights that we now enjoy, such as property rights, the right to divorce, rights within marriage and to our children, on finances and in employment, just to name a few. But getting the right to vote seemed nearly impossible, and both Anthony and Stanton felt that the vote was the central issue, because with it, women could affect other changes. Without it, women did not have a voice. Entitled “History of Woman Suffrage”, the books on her knee took 6 years and 3 volumes to write. It is the history of the movement that she holds, with an eye towards training the next generation of suffragists. Those books and the papers she is writing on the table, along with the Revolution newspaper that Anthony is taking out into the world, represent her continuous writing over so many years. She was a prolific, powerful writer and philosopher and it was her words that formed the foundation of the suffrage movement. Stanton and Anthony wrote and published their radical weekly feminist newspaper, The Revolution, here in NYC. It was primarily focused on challenging tradition in general and promoting women’s suffrage in particular. The newspaper’s famous motto will be featured on the folded newspaper in Anthony’s hand, visible to visitors: “Men, their rights and nothing more; Women, their rights and nothing less.” The paper gave them a platform to express their views during times that their voices might otherwise not have been heard. The writing table is central to the sculptural composition and narrative of their lives. The table represents their intimate friendship and the devotion they both felt to sharing their ideas with each other. The table represents their combined brilliance and the arguments for change that they produced together. While they remained very different people throughout their lives, they shared the passion for their work every step of the way. In our monument, they may be looking in different directions but sharing the writing table. It is literally supporting the work they are both actively engaging in. It will be a proper reproduction of the famous little tilt-top table that Stanton wrote the Declaration of Sentiments on and that traveled with them throughout their lives, and ultimately stood by Anthony’s casket in Rochester. Why does the child sitting at Stanton’s feet appear to be offering us a cup of tea? To tell the story of the five women who got together for tea one hot day in 1848, when the idea for the world’s first women’s rights convention was born. With her simple gesture, she is asking us to share in the future of the women’s rights movement, to step up and become a part of continuing what they started. The offer of the teacup doesn’t just tell a story, it is also both an invitation and a challenge. Stanton had become increasingly disgruntled with the social, intellectual and physical limitations she faced as a woman, and at the tea party that day she spoke her mind about what she viewed as women’s unfair position and general misfortunes in the new republic to her friends. The ensuing conversation was the catalyst for the convention that took place a mere six days later and launched the movement. The child is also a reminder that Stanton was a mother. Many women, like Stanton, have done and continue to do incredible things in their lives while giving birth and raising children, even though it may be very difficult. Stanton wrote about loving being a mother even while she felt frustrated and confined by the responsibilities of motherhood and domesticity, likening the feeling to that of “a caged lion”. Stanton also intended for her children to continue her work, so the child is symbolic of the need for future generations to continue the fight for equity. When she gave birth to her 1st daughter after several boys, she said, “Rejoice with me all women, for Lo, a champion of the cause is born. I have dedicated her to this work from the beginning. May she leave her impress on the world for goodness and truth”. The little girl with the teacups represents the generations of women that followed Stanton and Anthony in continuing the movement, including Stanton’s daughters, grand daughters and great daughter. The crowd of women marching around the middle of the base represents the untold numbers of women in the movement and their constant chain of activity and determination that gave us the right to vote. It’s about their tenacity and bravery and the power of this movement that could not have succeeded without the many women of which it was comprised. In addition to representing the activists whose names we don’t know, portrait sculptures of 21 intrepid leaders (as listed in the RFQ and Sculpture Fund website) whose names we do know will also be easily identifiable in the crowd of marchers. The scale of the marching figures will be approximately 3-feet high. In keeping with the traditional bases of the other subjects along Literary Walk and standard heroic statue bases in general, our proposed base is consistent in material, shape and scale. However, that’s where the likeness ends. The top of this one is not in line with the bottom. It looks to have been separated from the base and turned to point in a different direction. The subtle shift of the top represents the departure from the “old ways”, away from the traditional literary canon that is represented along Literary Walk, symbolizing a larger shift away from patriarchal society in general. The top is being lifted and moved by the parade of marchers around the center of the base. It is the power of the marchers that is helping society depart from the old ways and move towards finding a place that is more fair and balanced in representation for women in politics and society at large, in both the private and public realms. This base helps relay the story of what the Woman Suffrage Movement achieved; it created a major shift in our society. It relays this by illustrating the symbolic shift of the ground beneath our feet.